This week's Bread Baker's Apprentice Challenge is Peter Reinhart's recipe for Pain de Campagne (which you can get from his book below, starting on page 195-197). 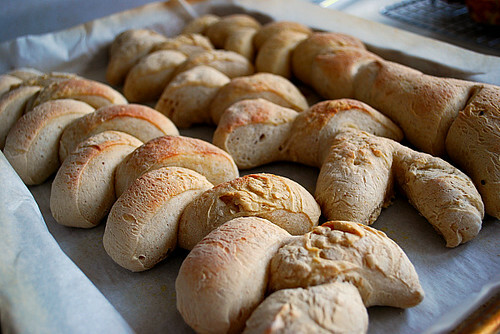 Friends joined me in the kitchen and together we prepared this simple and versatile bread recipe. Pain de Campagne happens to be a common bread dough used throughout France for several kinds of bread sold under various local names. All these breads are a form of a regular French baguette but to differentiate them, a small percentage of whole grain, whole wheat, pumpernickel, white rye or even cornmeal is used. Peter notes in his book that this additional grain gives the bread more character and flavor, and gives the bread that beautiful brownish gold, country-style crust that makes it stand out from the usual white flour French bread. My friends and I enjoyed working with this dough because we could shape it however we liked. We went through the book to find some interesting bread shapes and decided to form epi, a sheaf of wheat. However from the instructions in the book, we were a little confused (we blame the wine we had) as to how to cut the dough. So we improvised and had our own shape... similar to epi, but not quite. We like to think of it as bread slices on a stick - ha! The dough itself was easy to put together - pate fermentee (starter), bread flour, whole wheat flour, salt, yeast and water. It takes 2 days to put together, counting the pate fermentee which must ferment for an hour at room temp and then ferment in the fridge overnight before using. Making this bread gave me the opportunity to learn how other flours can be used with a base dough recipe - in this case, a French bread dough. Perhaps when I get more comfortable and better with bread baking, I'll try incorporating some unique flours for interesting dough flavors and other bread shapes. Bread slices on a stick... HEE! It looks like you did a wonderful job! 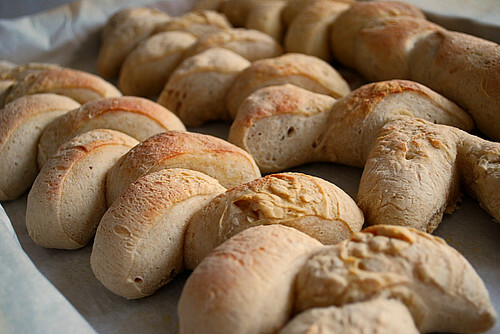 Whatever you call it, your bread looks wonderful. Great crust.